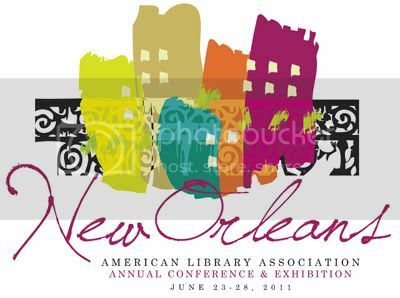 I'm going to be at the American Library Association's Annual Conference this whole weekend. I'm looking forward to hearing Dan Savage speak about the "It Gets Better" project and going to the YA Coffee Klatch where I'll get the chance to have coffee with over 25 YA authors including Cassandra Clare, Sarah Dessen, Claudia Gray, John Green, Maureen Johnson, Cheryl Rainfield and Maggie Stiefvater (I promise myself I will not oversleep and miss it like I did last year!) I'm also attending the Caldecott and Newbery banquet, and of course, I'm looking forward to hitting the Expo room, meeting publishers and seeing all the great things that are about to be published. Just like last year, I'll be livetweeting @madiganreads which is an awesome way to meet up with folks, keep up with events and panels that I can't make it to (since I can't be everywhere at once) and record my own thoughts and impressions throughout the weekend. I had a blast! I'll be updating soon about all my adventures.